Luther’s Death House Museum, Andreaskirchplatz 7, Eisleben (© Red Brick Parsonage, 2018). This has been an officially, though erroneously, designated memorial site since 1863. Even though the quality of his work declined in his waning years, Martin Luther ended his life well. His last actions show that he ended his life serving his neighbors in love. He spent the last days of his life at the end of January and beginning of February 1546 trying to help disputing counts resolve their differences in the city of Eisleben. 1) No one can understand Vergil in his Bucolics and Georgics [poems about the life of a shepherd and a farmer], unless he has been a shepherd or farmer for five years. 2) No one (as I see it) will understand Cicero in his letters unless he has been active for 25 years in some prominent commonwealth. 3) Let no one think he has sufficiently tasted the Holy Scriptures, unless he has governed the churches for a hundred years with the prophets. Do not tamper with this divine Aeneid [Vergil’s epic masterpiece], but bow down and adore its very footprints. Luther rallied his strength and spoke a distinct “Yes,” then fell asleep for the final time. At about 2:45 he grew very pale under his face, his feet and nose grew cold, and he took a deep but gentle breath and gave up his spirit peacefully. Martin Luther’s Headstone beneath the pulpit in the Castle Church (© Red Brick Parsonage, 2018). 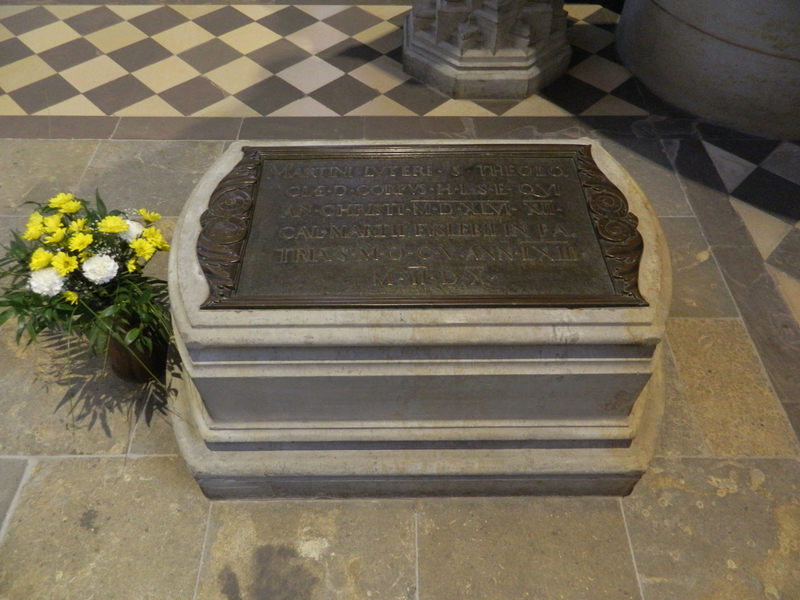 His mortal remains are still buried in a coffin almost eight feet beneath the floor under the pulpit of the Castle Church. It is humbling to stand in front of it and to ponder how the triune God used this frail, sinful human instrument. Those who believe in the Savior of the world as Luther did know that, if they were suddenly to collapse and die, right there in front of his grave or anywhere else on earth, their eternal destination is not in question. Heaven is their home, and it has nothing to do with them being such good people. By nature they deserve hell just like Luther and everybody else. But because of the good news of righteousness graciously given that was restored to its proper place through Luther, they know that they are not going to get what they deserve. They are going to get what their Savior has won for them. Melanchthon’s words are true in more than one way: Et mortuus vivit. Even dead, he lives. During his final days in Eisleben, Luther stayed with his friend Johann Albrecht, the city clerk. 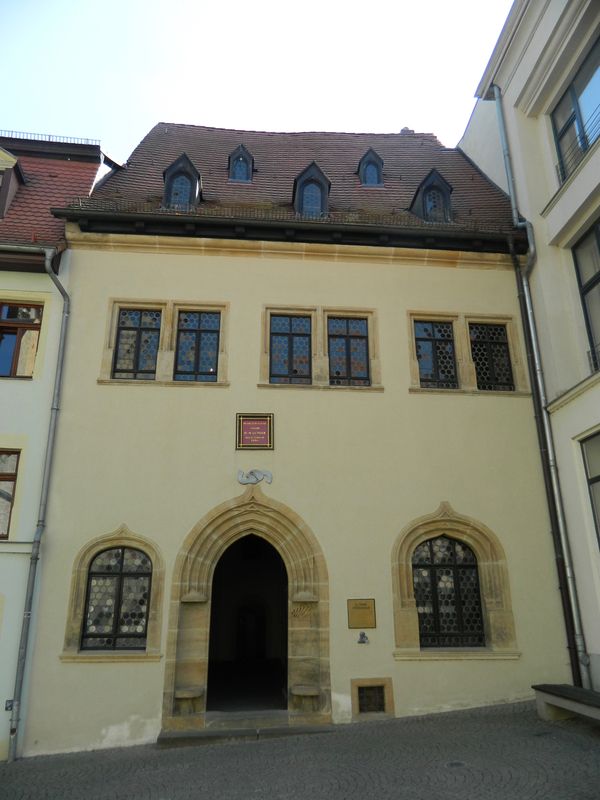 After Luther’s death, the house quickly developed into a popular pilgrimage destination. Visitors would bring pieces of his deathbed back home; these shavings were allegedly used by some to treat toothache. Since these superstitions were reminiscent of the relics cult that Luther had condemned, the evangelical theologians in Halle put an end to them in 1707 by unceremoniously burning Luther’s deathbed and having the house closed to the public. In 1726 Eusebius Christian Francke, a cantor, historian, and amateur theologian, having already published a history of the Countship of Mansfeld in 1723, drew up a Versuch einer Historischen Beschreibung der Hauptstatt der Graffschaft Mannßfeld und weltberühmten Geburthsstadt Lutheri Eißleben (Attempt at a Historical Description of Eisleben, the Chief City of the Countship of Mansfeld and World-Renowned City of Luther’s Birth; manuscript in the Eisleben City Archives). In this work he identified the house at what is today Andreaskirchplatz 7 as Luther’s death house. However, he confused the house of Dr. Philipp Drachstedt, in which Luther had died, with the house of his son, Barthel Drachstedt, a mere 50 meters away. Though Francke’s work was never published, a later local chronicler consulted it and used its information towards the end of the century, thus legitimizing the error. King Wilhelm I of Prussia bought the mistakenly identified house in 1862 and his government subsequently established it as a Luther memorial. The government also commissioned art professor Friedrich Wilhelm Wanderer in 1892 to oversee the renovation of two rooms in the museum, which were thought to be the ones mentioned in Justus Jonas and Michael Coelius’ report of Luther’s death. Wanderer was to see that these rooms were period-correct in style and filled visitors with a sense of reverence for the man who had supposedly died there. In the late 1960s a chemist and amateur historian named Franz Rämmele was in the Eisleben Museum doing some research on the history of the Department of Central Labor of the Wilhelm Pieck Mansfeld Combine VEB (German abbreviation for Publicly Owned Company). He came across an ancient city plan which showed a street where Luther’s Death House should have been. Resolving to the get to the bottom of the mystery, he eventually synopsized his findings in an essay that he submitted to the museum for safekeeping; he also gave a copy to the Institute for Monument Preservation and filed another in the Mansfeld Combine Archives. Word began to spread in the city that Rämmele had discovered that Luther had actually died in the Socialist Unity Party of Germany’s district administration office for the Mansfeld Combine. The First Secretary of the administration, Ernst Wied, saw the rumors as an attack on the political party, which consistently painted Luther in a negative light. He summoned Rämmele and “made it clear that Luther already had a death house,” though Rämmele later claimed that the secretary’s fears were unfounded, because he never had any intention of publishing his findings. Hotel Graf von Mansfeld, Markt 56 (© Red Brick Parsonage, 2018), which marks the actual location where Martin Luther died. In 2001 Dr. Eberhard Eigendorf caused a stir with his self-published work, Gab es in Eisleben Wohnschlösser der Mansfelder Grafen? In welchem Hause verstarb der Reformator Martin Luther am 18. Februar 1546? (Were There Residential Castles for the Counts of Mansfeld in Eisleben? In What House Did the Reformer Martin Luther Pass Away on February 18, 1546?) Both Eigendorf and Rämmele came to the same conclusion, that Martin Luther died at what is now Markt 56. The original building has long ago burned down. 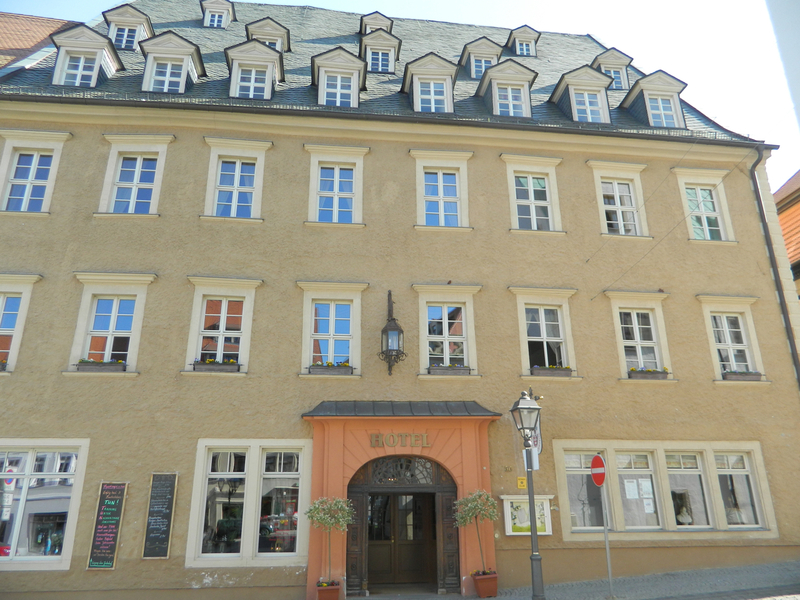 Today the site is occupied by the Hotel Graf von Mansfeld, a well-rated restaurant and hotel.